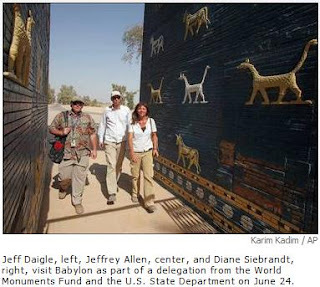 So, plans are being made now in a joint US-Iraqi effort to restore some of the ruins of Babylon and implement a plan to draw tourists to the area. Before the removal of the Saddam Hussein regime, millions of dollars had been spent by the dictator to restore many of the ruins of the ancient city. But since the invasion of the US-led coalition, the head of the British Museum's Near East department has criticized the soldiers for "damaging and contaminating artifacts" there. So now, with $700,000 allocated by the US State Dept. and the World Monuments Fund, a plan is being developed with the Iraqi government "to preserve the site and develop a local tourism industry". (emphasis mine) No doubt, with that "tourism industry" will come hotels, restaurants, souvenir stores, etc., the beginnings of a viable city. So even though the Bible says that it will become a great commercial and religious center of the world before God destroys it, it certainly is NOT that thriving metropolis YET. BUT, we may be witnessing the beginnings of its revival! Opponents of this interpretation usually point to the United States, Rome, or some other city as the "new Babylon" spoken of in the Bible and not the actual city situated on the Euphrates River sixty miles south of Baghdad, Iraq. They interpret Rev. 17 to be speaking of Babylon symbolically to actually mean some other city. And, they would certainly say that these recent attempts to restore the ruins of Babylon are to only create a tourist attraction, at most... hardly the great metropolis described in the Bible. It is true that Babylon is not presently a great city. But again, what we're seeing there now is only the beginning. But even as a tourist attraction with only a very small population, it is NOT the uninhabitable ruins that Isaiah and Jeremiah said it would become forever. So, any previous "destruction" of Babylon does NOT fit the Biblical description. In fact, history shows that even though Babylon was defeated, it was never utterly destroyed. It simply fell into centuries of decline and insignificance after the Medo-Persian Empire defeat of the Babylonians in 539 BC. With the political changes in Iraq in the last six years and now the beginnings of the restoration of Babylon, the stage is being set for the fulfillment of Bible Prophecy! Babylon is on the rise again!